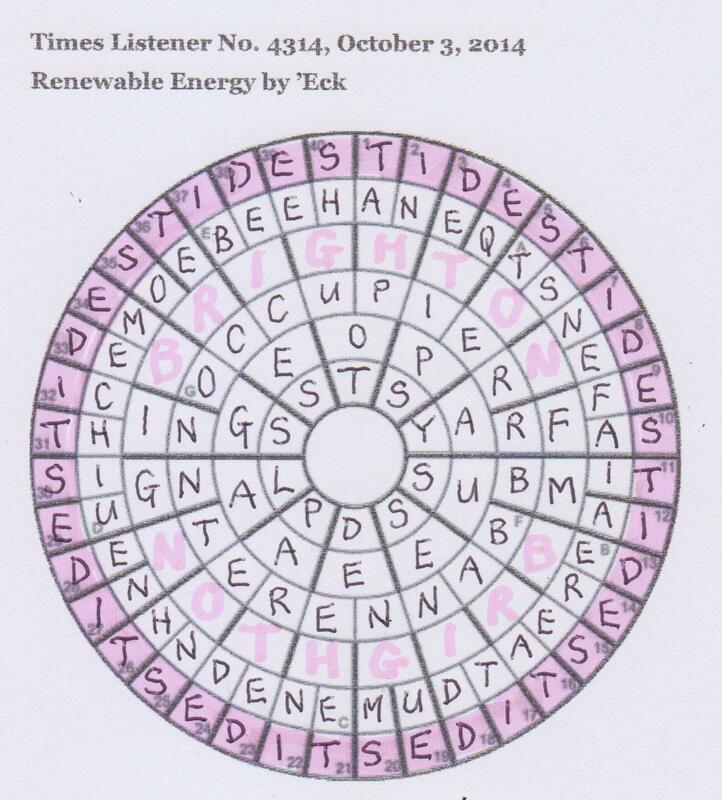 Circular crosswords have a special appeal for me. They were the only kind I set for my first few years of setting and I know how very tough it can be when you reach the very last words and nothing is available. Of course, jumbles are an easy way out of the dilemma, but they weren’t used as a ‘cop out’ in this case but simply to confirm and add those last few letters that were needed to give the complete message. But I am leaping ahead. Initially we read that complicated preamble with real misgivings: extra letters, jumbles, clues to be amended and clashes. I had to check through the clues to reassure myself, at least, that ‘Eck qualifies for the Listener imbibers club and indeed he does with not just one but ‘roughly 1 m bottles! (Recounted the odd talE (roughly 1 m) bottles not enumerated to start with’ [YARD round N E(numerated)]. No wonder we find ‘SKins, perhaps, returning drunk, accepting disgusted reaction’ [SOT< round UGH giving TOUGHS] – quite an appropriate word in the context of the novel that we finally identified (though at first we had spiVs as the misprint – that just reminds me how difficult it can be to produce a misprint for every single clue in a crossword. Indeed this was a tough solve and after two hours our grid was only one third complete with luck finds HENNED, OCCUPIER and FASTEN as ring clues, confirming our entries. As we solved, it was becoming clear that the same five letters were appearing in the outer circle – that is to say ID EST, and we tentatively completed that ring. Even more useful was the fact that all our clashes were in the third circle, reading inwards, and the pdm came when, in two sets of letters, they spelled out BRIGHTON. Brighton Rock! So we had the novel and the moniker of its main character, Pinkie. We had to ‘highlight 40 cells as cryptically suggested by the moniker of the character under discussion’. Rock is a cheerful pink colour, isn’t it? Just the colour of my highlighter, and the name runs right through it (I used to be so excited by that as a child), so we knew how to complete the puzzle but it took me another couple of hours to work out the remaining clues and find the quotation. than a search through the dusty old orange Penguins in the basement). There were still all the names to understand too. How subtly they were incorporated into the clues. We puzzled for an age about what SANDRA was doing in a clue that clearly led to STOEPS. Of course, we had to anagram it to give NASARD which is a type of STOP that circled E(uropean) S(ociety). LOIS, NICO and NORMA appeared lower down and some unjumbling of the names produced a fine clue for YARFAS (Yell’s peat bogs) ‘In Yell they haVe SOIL for fuelling fight about COIN for ROMAN. TABITHA of MADISON became HABITAT of DAIMONS to give the solution EREBUS … and so on. This was probably the toughest solve of the year so far but how very rewarding. A most impressive piece of compiling. Thank you ‘Eck. This entry was posted on 24 October 2014 at 4:00 pm	and is filed under Solving Blogs. Tagged: Brighton Rock, by 'Eck, Pinkie, Renewable Energy. You can follow any responses to this entry through the RSS 2.0 feed. You can leave a response, or trackback from your own site.